We received the e-mail about the beautiful NOH8 photo on the day we read the transcript of Meet the Press on August 14, 2011. I said (censored) and my husband named the photo, "Here's To You Michele Bachmann." Anyway, we are from West Hollywood and were to travel to London to celebrate our 33 years together - 3 of which were married. 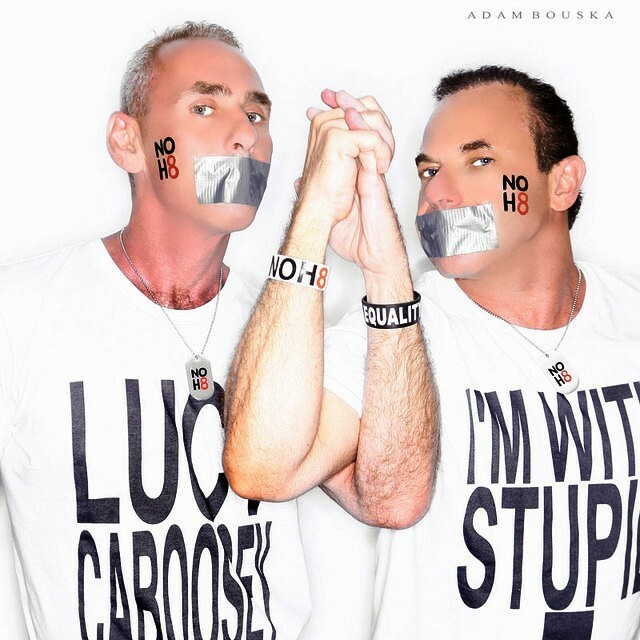 We had planned to get a NOH8 photo for our anniversary. But then Don's appendix ruptured, and gangrene entered his blood. Needless to say; we weren't going to be able to take the photo! But -- Don was approved to travel the morning we were to have left for London, and we made it! We thought it was so romantic to fly around for a photo. We also happened to have the best Glee concert seats ever.